The scientific Genus name Chelidonium is derived from the Greek word “chelidor”, meaning swallow. 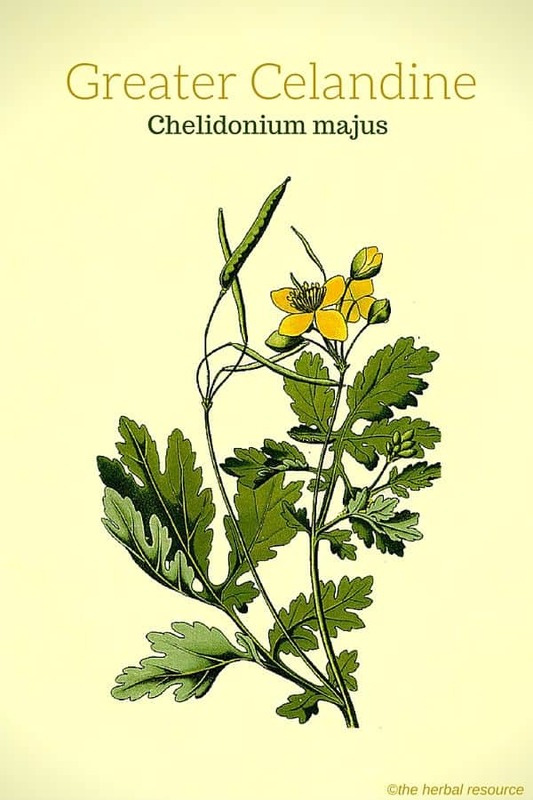 Other Common Names: Common celandine, garden celandine, celandine poppy, felonwort, swallow wort, wart wort, svaleurt (Norwegian), celidonia (Spanish), eclaire, chélidoine (French), Schöllkraut (German), svölujurt (Icelandic), keltamo (Finnish). Habitat: Greater celandine can be found growing wild in almost all European countries, West Asia, North Africa, and North America. The plant prefers dry sunny areas and is often found next to buildings, or thickets. Plant Description: Greater celandine is a perennial plant belonging to the poppy family (Papaveraceae). It can grow up to 60 cm in height and the whole plant contains a large amount of yellow latex that turns orange when it comes into contact with air. The stems are branched with long hairs and produce pinnate, round-toothed leaves that are bright green on top and blue-green underneath. The yellow flowers sit in umbrella-shaped inflorescence, usually two to six together. The flowers have two sepals and 4 yellow petals. The plant blooms from May to August. After flowering, narrow and elongated seed capsules develop. Plant Parts Used: The whole plant is utilized in herbal medicine. The herb is collected when in bloom and dried at up to 35 ° C, separate from other herbs. Active Ingredient and Substances: Greater celandine contains isoquinoline alkaloids (0.35 to 1.3%) such as chelidonine, chelerythrine, sanguinarine, berberine and coptisin. In addition, the plant contains, flavonoids, phenolic acid, saponin, carotenoids, bitter substances, essential oil, organic acids, vitamins, and some other substances. The corrosive effect of the milky fluid (latex) present in the herb is probably due to the alkaloid chelerythrine. Greater celandine has been used traditionally as an herbal remedy for liver diseases, many ailments of the digestive system and for eye irritations. It was used internally to support the liver and bile duct and protect against liver damage caused by hepatitis. It has also been used to stimulate digestion and treating cramps related to the digestive system. The milky latex was used externally to remove warts, soften corns and detach bad teeth. The main active ingredient found in greater celandine is the alkaloid chelidonin, a substance not unlike papaverine found in the opium poppy (Papaver somniferum). Chelidonin has an antispasmodic effect and seems to specifically target the bile duct and bronchi. Furthermore, the substance has mild tranquilizing properties. 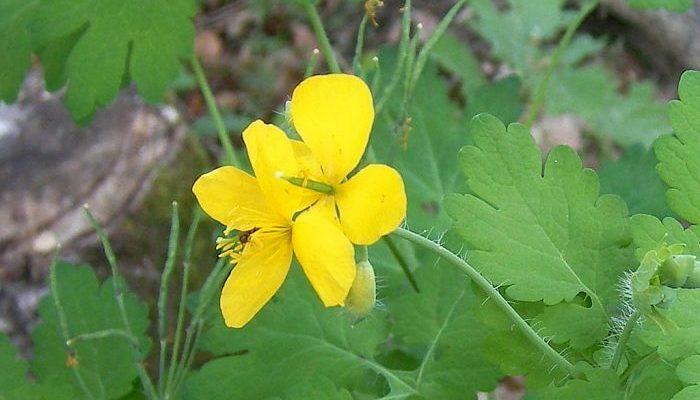 When greater celandine is used internally, its medicinal effect is rather unpredictable. This could be explained by the great difference in the herb’s quality which is mostly because any herbal preparations quickly lose their medicinal properties when stored and also that there still no proven methods to stabilize the active ingredients. The herb may retain its properties for up to approximately six months, but if stored longer its effect seems to decline rapidly. This is probably one of the reasons greater celandine has a rather ambiguous status among herbalists. When the herb is intended for internal uses it is considered to have somewhat limited value and it is seldom used by herbalists on its own but rather in combination with other medicinal herbs. Today, it is mainly used as an ingredient in herbal teas for its antispasmodic effect on the gallbladder and to stimulate bile flow, but since the content of the alkaloids and other ingredients in the plant varies so much, it is difficult to predict the effect. Still, there have been several studies that have shown that greater celandine has a rightful place in herbal medicine. One such study strongly indicated that the herb could be useful in the treatment of cramps-like conditions in the abdomen associated with irritable bowel syndrome. Another study found that when it was ingested in the form of a cough syrup or extract (equivalent to 15 g of herb pr. day) it resulted in overall improvement in about 80% of a group of patients suffering from chronic bronchitis. The plant has also been found to be effective treatment for whooping cough. The German Commission E gives greater celandine the green light and recommends it as a treatment for cramping discomforts related to the bile ducts and the digestive tract. Greater celandine has been used externally to speed up healing of minor wounds, cuts, and scrapes and as a relief for skin problems such as eczema. The yellow milk sap from the plant is a strong corrosive substance that can dissolve warts and corns due to the action of protein splitting enzymes. The herb has also antimicrobial effect and may be helpful as an external treatment for fungal infections. In Chinese herbal medicine, the herb is used as an herbal remedy for gastritis, ulcers, enteritis, jaundice, abdominal pain, bronchitis, and whooping cough. The recommended daily dosages in China ranges from 3 to 9 grams of the herb, or even higher. These relatively high doses are mostly in the form of a decoction and can be justified by the fact that in this form not too much of the active alkaloid chelidonium is released. However, when greater celandine has been used in traditional Chinese herbal medicine, some patients have reported various degrees of side effects like dry mouth, dizziness, digestive discomfort, diarrhea, nausea and a slight reduction in the number of white blood cells. The symptoms disappeared normally in 3-5 days after the treatment ended. The German Commission E states that greater celandine can be used internally in the form of the dried herb, powder or dried extract. The dosage recommended by them is set to 2.5 g herb daily, equivalent to 12-30 mg of the total alkaloid content, and at these doses, there should be no interactions, side effects or contraindications. For all commercial products containing the herb, the manufacturer’s recommendations and instructions should be followed. Greater celandine is a highly toxic plant and should be treated as such. If the plant sap comes in contact with bare skin, it can cause a heavy rash so when the plant is collected it is advised to use gloves. After consumption of the fresh herb, there have been reports of serious inflammation and blistering in the mouth, tingling and burning sensation in the throat, stomach pain, vomiting, bleeding ulcers, diarrhea, fainting, coma, and even death. The herb is contraindicated for children and pregnant and lactating women. Any use of it for more than two weeks is discouraged if the herb is used on its own, in combination with other medicinal plants or herbs it may possibly be used for longer periods. Apart from the external use of the plant sap as a remedy for warts, greater celandine is not suitable for self-medication. Any internal use of the plant must only be done under the supervision of a qualified healthcare provider or a licensed herbalist. Applying the herb directly on the eyes as a treatment for various eye problems, as it was done in the past, is strongly discouraged. Fetrow, Charles W. & Juan R. Avila: Professional’s Handbook of Complementary & Alternative Medicine. Springhouse, Pennsylavania, Springhouse Corporation 1999.Cunningham, Scott: Cunningham’s Encyclopedia of Magical Herbs. St. Paul, Llewellyn Publications 2000.